2010 Tour of Britain winner Michael Albasini continued GreenEdge’s solid start to the season by winning the opening stage of the Volta a Catalunya. The Swiss rider attacked from a three-man group on the third-category Alt de Collsacreu 15km from the finish in the seaside town of Calella, and held on to take a comfortable victory. His breakaway companions Anthony Delaplace (Saur-Sojasun) Nicolas Edet (Cofidis) stayed clear of the peloton to complete the podium, while Kenny Van Hummel won the bunch sprint for fourth. Team Sky’s Bradley Wiggins seemingly had a trouble-free day, and finished within the main group. 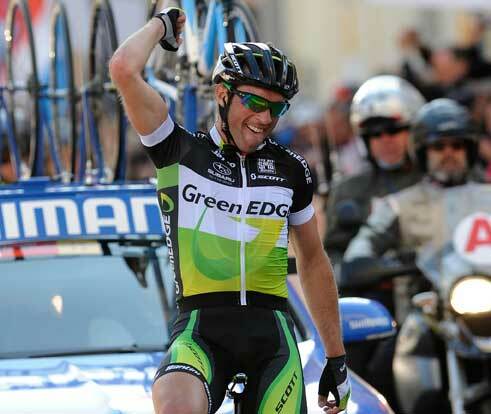 Two days after Simon Gerrans won Milan-San Remo, teammate Michele Albasini takes stage one of the Tour of Catalonia. Paris-Nice victor Bradley Wiggins rides comfortably in the bunch. 5. Ben Gastauer (Ag2r-La Mondiale) at st.